About a decade ago, in the northern Argentine city of Colón, I encountered a pair of US cyclists who had traveled through Chile using my recently published first edition of the Moon Handbook to that country. 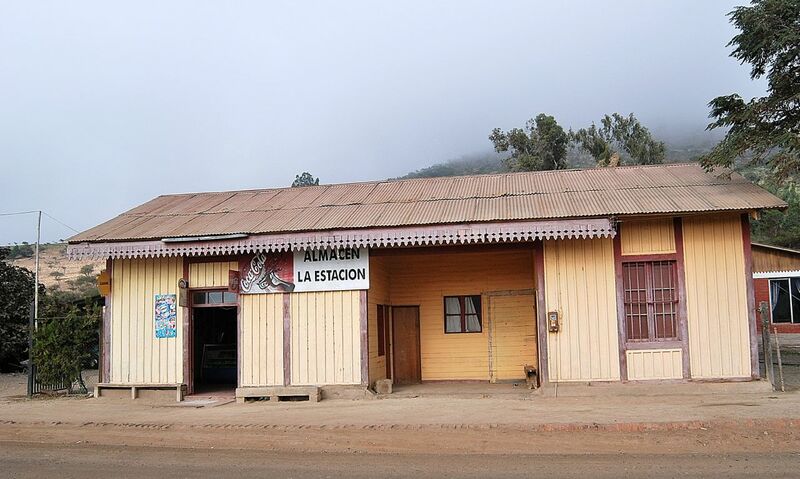 They were especially enthusiastic about my recommendation about cycling the old railroad route through the Andean foothills, where slow-moving trains from Santiago’s Estación Mapocho once chugged all the way to the nitrate ports of the Norte Grande, including Iquique and Pisagua. The station, pictured below, is now a cultural center. For motorists, bikers, and cyclists really intent on getting off the beaten track, there’s no better alternative than the former Ferrocarril Longitudinal (Longitudinal Railway) that, until the Panamericana opened in the early 1950s, connected the Chilean heartland with the Norte Chico and the Norte Grande. 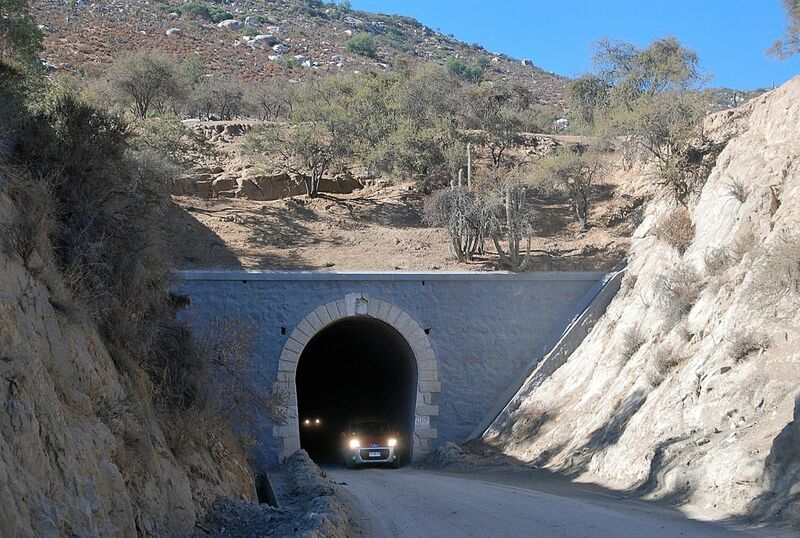 Passing through five former train tunnels, with countless ups and downs along the isolated Andean foothills between La Ligua and Ovalle, the Norte Chico sector is one of the country’s unappreciated gems for Chileans and foreigners alike. In the 1930s, Chilean dictator (later elected president) Carlos Ibáñez del Campo outfitted his 1928 Packard limo (pictured above) with wheels that could ride the rails between Santiago and the southern city of Puerto Montt. I’ve never done anything quite like that but, several times, I’ve driven segments of the former northern railway, popularly known as the “Longino.” Along the entire route, keep an eye out for condors--that enduring symbol of the Andes reminding us that the route was, first and foremost, an Inka road. 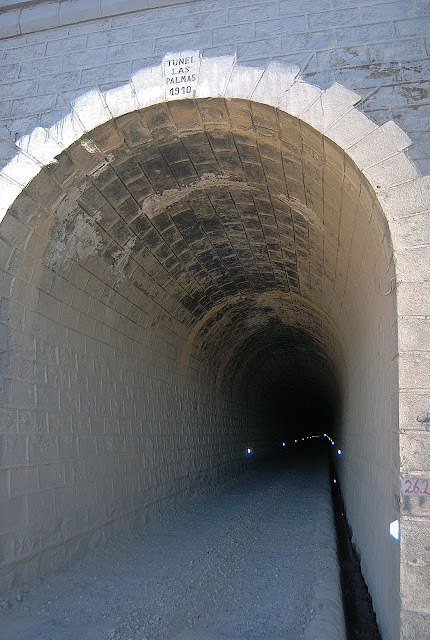 Last April, for the first time, I drove the Longino’s Norte Chico segment north to south (rather than south to north), from the weathering foundations of former station at Auco, near the city of Illapel, to the town of Cabildo – a full day’s drive. 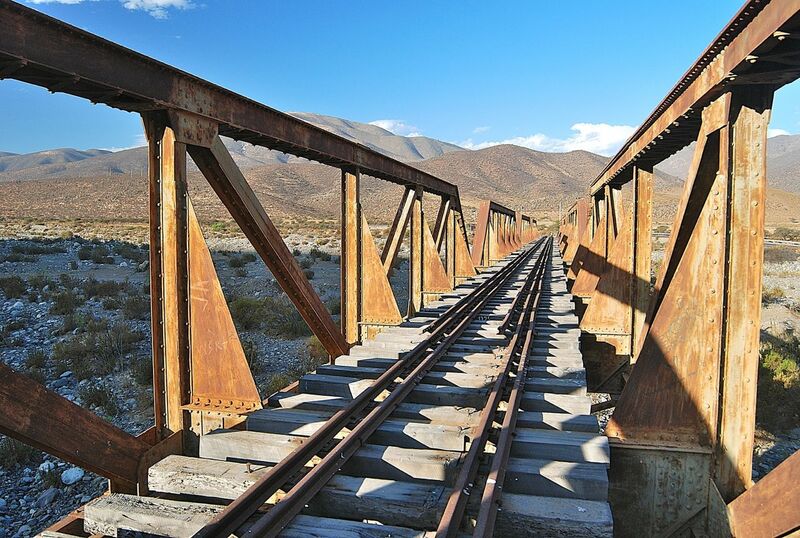 At Auco, a bridge (pictured above) still spans the normally dry bed of the Río Illapel, but walking across it requires caution, as it’s missing many ties. At Limáhuida (about 20 km south of Illapel), the line’s oldest surviving station (pictured above) is now a small grocery. Along the route, huasos in their characteristic flat-brimmed chupallas (sombreros) are a regular sight, as are flocks of goats on the dry hillsides. Between Limáhuida and the oddly named town of Caimanes (there are no large aquatic reptiles in this desert landscape), the road passes through three tunnels; the longest is the Túnel las Astas (pictured below), dating from 1912, whose ceilings drip with groundwater. Its length makes it the likeliest in which to encounter a vehicle heading the other direction. Perhaps the most scenic segment is Cuesta las Palmas, about 20 kilometers south of Caimanes, passing newly planted avocado and citrus orchards. 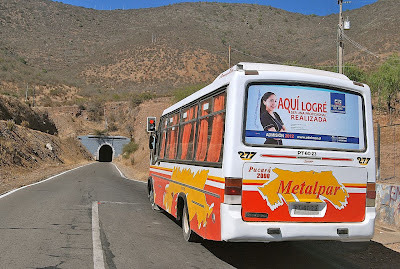 At the regional border, the gravel road penetrates the Túnel las Palmas, surrounded by mature palm trees in the valley, and continues as a paved road toward Pedegua and Cabildo. A short distance north of the tunnel, a roadside café selling fresh juices is one of few businesses catering to the handful of travelers who pass this way. 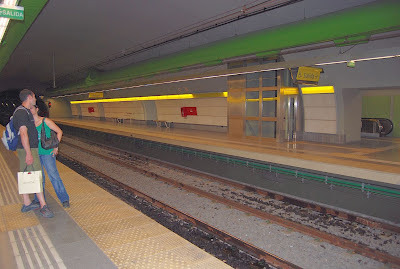 Approaching Cabildo, a semaphore regulates traffic through the Túnel las Grupas (pictured below), the only tunnel located in a populated area. From Cabildo, there are paved highways west toward the coast and south to Santiago. Today’s entry covers a potpourri of Argentine topics. Is Bigger Better - Or Even Possible? Argentina’s currency and import restrictions have irked many Argentines – the CEO of the communications giant Telecom has remarked that the easiest way for an Argentine to get an iPhone is to go to Miami – but there’s a new and unanticipated shortage that’s slowing one at least part of one of Buenos Aires’s most vigorous industries, plastic surgery. 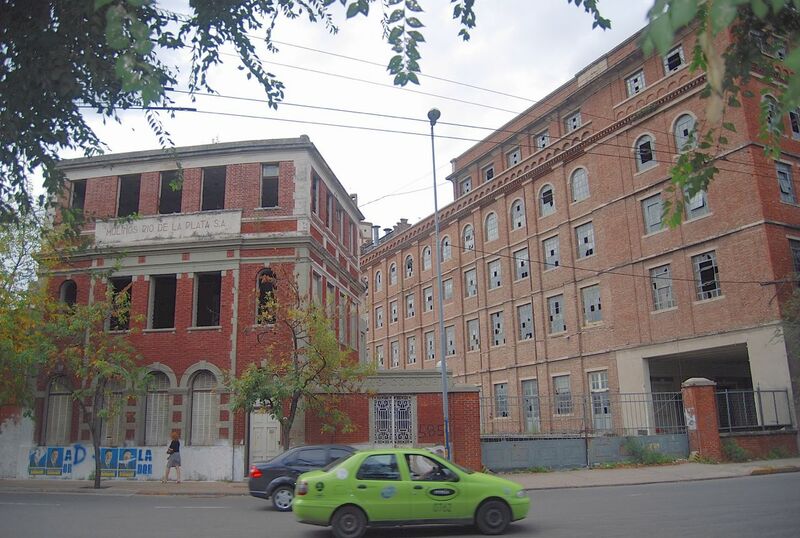 According to the city daily Clarín, the restrictions have caused a shortage of breast implants. Obviously, that won’t shut down the plastic surgery sector entirely, but it’s certainly a significant part of it, so to speak. 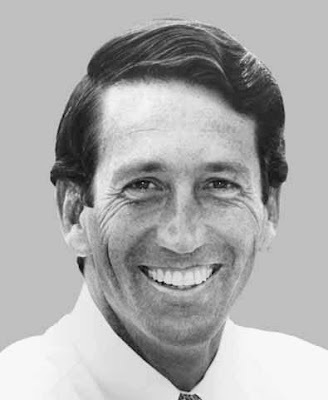 About three years ago, former South Carolina governor Mark Sanford made international headlines with his geographical and marital misadventures on the "Appalachian trail" and the "coast of Buenos Aires province." That cost him his political career but, according to the Buenos Aires daily Clarín, he’s back. After a nasty divorce, Sanford (photograph in the public domain) has apparently proposed to his former mistress María Belén Chapur, and did so publicly at one of my favorite neighborhood restaurants, the Bella Italia Grill. According to my wife, this sort of public proposal is rare in Argentina – I’ve certainly never seen it - and considered a bit tacky. The Bella Italia is just around the corner from our apartment, and Ms. Chapur’s apartment only a little farther away. Should I spot them on the sidewalk, I’ll have to ask whether he’s finding his way around the country better. There’s been a change in schedule. 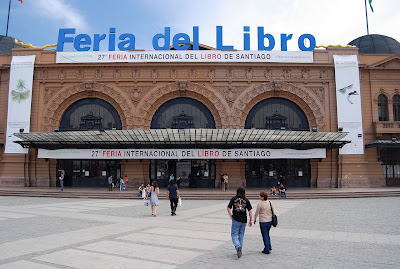 I will still give a digital slide lecture on Buenos Aires at Tango by the River in Sacramento, but it has been postponed until Friday, September 21st, at 6 p.m.
Limited to a maximum of 50 people, the event will also include tango performances; admission costs $10, or $8 in advance. I have spoken here several times before, and we always sell out, so plan in advance. Signed copies of my Moon Handbooks on Argentina, Buenos Aires, Chile and Patagonia will be available at discount prices. Today’s entry focuses on current topics in southernmost Patagonia, on both the Argentine and Chilean sides. Large parts of Chile and Argentina, mostly along the northern and central Andes, are seismically active, as I experienced myself earlier this year. As a California resident, that doesn’t necessarily unnerve me, but it’s a little unusual to hear of strong seismic movements in southernmost Patagonia, where the popular destination of El Calafate has experienced several quakes over the past month or so, most recently on Sunday. That’s about all the information I could find - not even the US Geological Survey’s earthquake page has registered any movements in the area over the past several days. The Smithsonian’s Global Volcanism Program entry says that Volcán Reclus last erupted about a century ago. 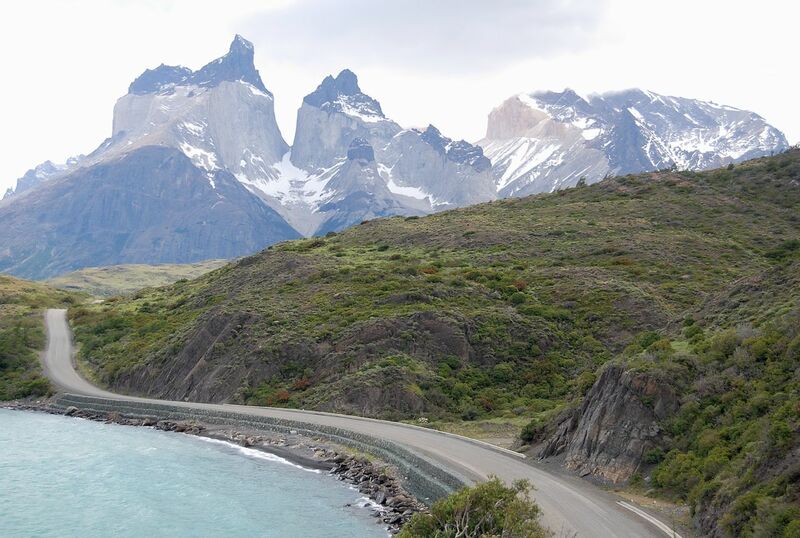 Next month, the Nómadas International Group will sponsor the initial Patagonian International Marathon in Chile’s Torres del Paine. 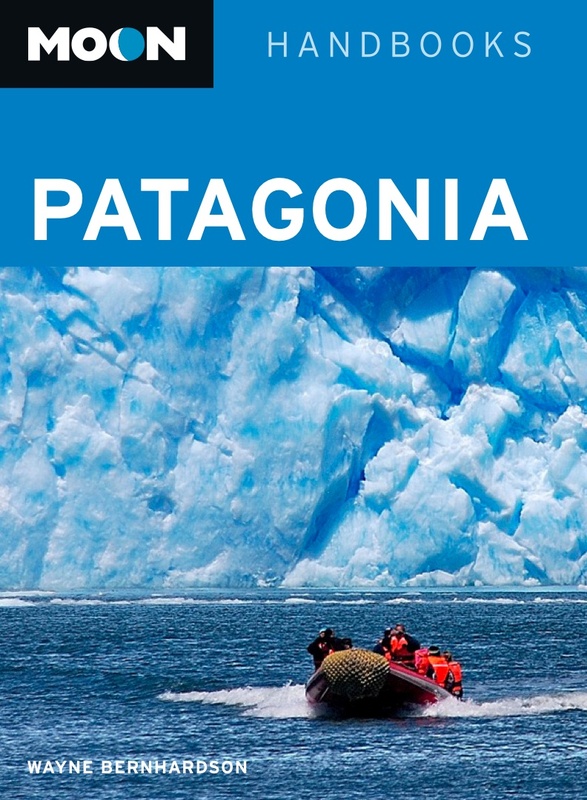 Working in tandem with the NGO Reforestemos Patagonia, the event will publicize the need to importance of restoring the park’s natural woodlands after a devastating fire last summer. Prospective participants may also choose to compete in a half marathon or ten kilometers. Patagonia in general, and Paine in particular, could offer real challenges and opportunities to distance runners. Early spring, when the event will take place, is one of the windiest times of the year. When I lived in the Falkland Islands, where wind conditions are similar, I used to run a mile and a half every morning on the then new road toward Mount Pleasant Airport and, against the wind, it would take me about 20 minutes; the return, with the strong wind at my back, would take barely half that, and I sometimes had to slow myself to avoid falling. Depending on the individual participants, the exact route, and the winds of the day, a Paine marathon could produce some interesting times – though the wind velocities would probably invalidate any records. Brian Pearson is the founder and CEO of Santiago Adventures, which opened in 2003, in the city borough of Providencia. One of the things that most attracted him to Chile was the snows of the Andes, so I recently asked him some questions about the Chilean ski scene. He appears on the right in the photograph below, taken by Kevin Chartier of the cat-skiing company Ski Arpa. WBB: When we spoke in your office a few months ago, I recall your mentioning that skiing was one of your main reasons for relocating to Chile. Where did you come from originally, and why did you choose Chile? Did you consider anywhere else? BP: I'm from upstate New York originally and spent time growing up in Colorado and Vermont. I've skied my entire life and when we decided to live in South America being near a resort really mattered to me. The mountains around Santiago have the highest concentration of resorts in South America so it was a strong draw. We were trying to make a calculated risk when we decided to live abroad and we always considered Chile as our first choice given its stable government and strong economy. WBB: What’s the ski season looking like so far? Where is the most and the best snow conditions, and which of the resorts is busiest? I understand there’s a real invasion of Brazilians this year. BP: It has been a tougher season than normal. 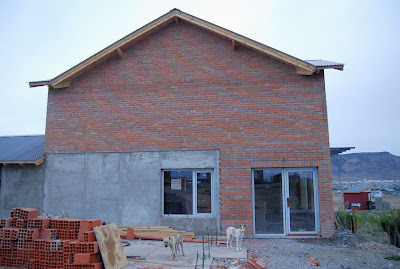 After two dry winters in 2010 and 2011 many people decided to wait and see before booking. When the snow didn't really show up, neither did the reservations. Brazil has always been a big part of the winter tourism in Chile and Brazilian visits are up 40% this year, so a real boom. The rest of the market is principally from the US and Canada. There are some Argentines that come as well. WBB: In general, what are the conditions on the Chilean side of the Andes? How would you distinguish the central Chilean ski areas (such as Portillo and Chillán) from those farther south (Pucón, Antillanca, Osorno, for example)? BP: We are in the middle of a big storm cycle so I'm happy to report the conditions right now are powder. We expect some great skiing over the next week and another storm is right behind this one. The central region resorts are much higher in elevation - the base elevations are 9,000 to 9,500 feet and skiing up to 11.500. This is much higher than the resorts in the south, which have max elevation below 9000 feet. From Chillan and further south all the resorts are on volcanoes. These resorts have less vertical feet of skiing and much mellower terrain. 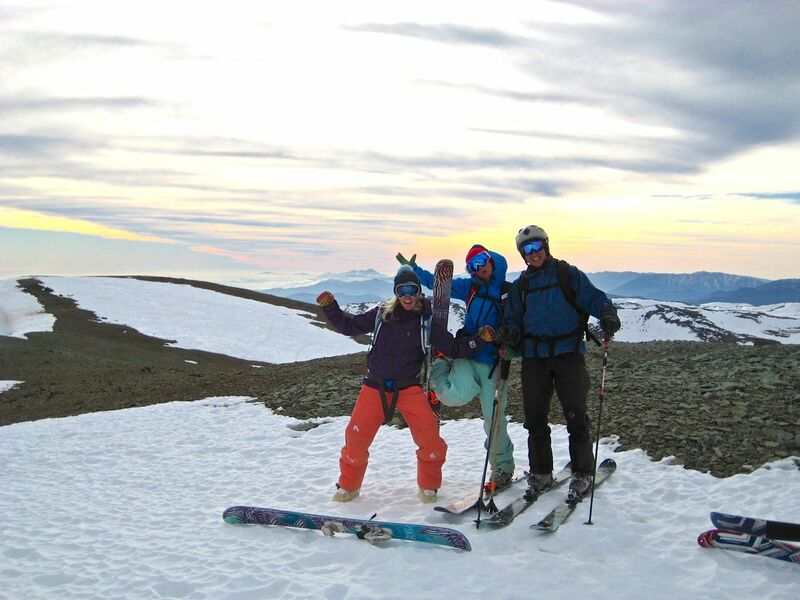 Although, more adventuresome skiers go ski touring to the top of many of these volcanoes including Villarica, which is one of the most active volcanoes in South America. WBB: How is hotel occupation at the Chilean resorts? I understand Valle Nevado has undergone a major upgrade. Do most people stay in Santiago and commute to the ski areas? BP: Occupation is pretty good with over 80 percent at Portillo and Valle Nevado. 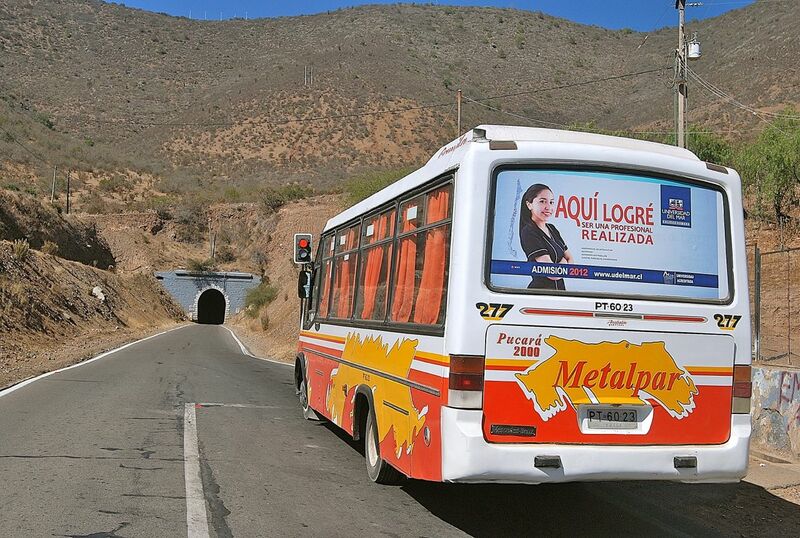 There is definitely a large percent who stay in Santiago and drive up to the resorts. Prices are much more reasonable in the city and it is only 50 minutes to La Parva or El Colorado. There is also better restaurants and nightlife in Santiago and on the days you don't ski you can visit wine country or Valparaiso. Both are within an hour of the city. they are investing over US$100 million. WBB: Do you have anything to say about the Argentine ski resorts? The ones in Patagonia had a rough time last year because of last year’s eruption of the Puyehue volcano. BP: Sorry, don't know them. I hope to go to Las Lenas one day but we are always so busy with our cat skiing resort that it is hard to get away. Bariloche is having a much better year after the volcano eruption last year. WBB: Can you elaborate on heli-skiing to me? I understand it’s a new concept in this area. BP: With a helicopter you can fly deep into the Andes and access better snow conditions on untracked slopes. You go in a group of just four riders with a professional guide that is highly trained in snow safety, route finding and emergency medicine. Of course they are also pretty good skiers. The runs are long and sometimes you ski for 30-40 minutes before you get back to your helicopter waiting for you at the bottom. You keep doing this until your legs just can’t take any more. Definitely an experience every skier should try at least once in their life. There is somewhat of a misconception that it is extreme skiing when you go heli-skiing - what you see in all the ski movies. But the idea is to enjoy the mountains and ski on safe terrain which is typically has less than a 30 degree pitch. It's more expensive in Chile as the flying conditions are more demanding on the helicopter. A full day in Chile is about US$1,800 per person for a group of 4. But you can do single runs at Portillo and Valle Nevado for under US$300 if you want to try it out first. Yesterday, finally, a tentative truce ended a ten-day Subte strike that had paralyzed the city of Buenos Aires. Contentious labor relations are not unusual in Argentina, but this one was more complicated than most, as it involved an ostensible devolution of power from the powerful federal government (which controlled the system) to the city government (a political adversary) without providing sufficient funds to run the system. 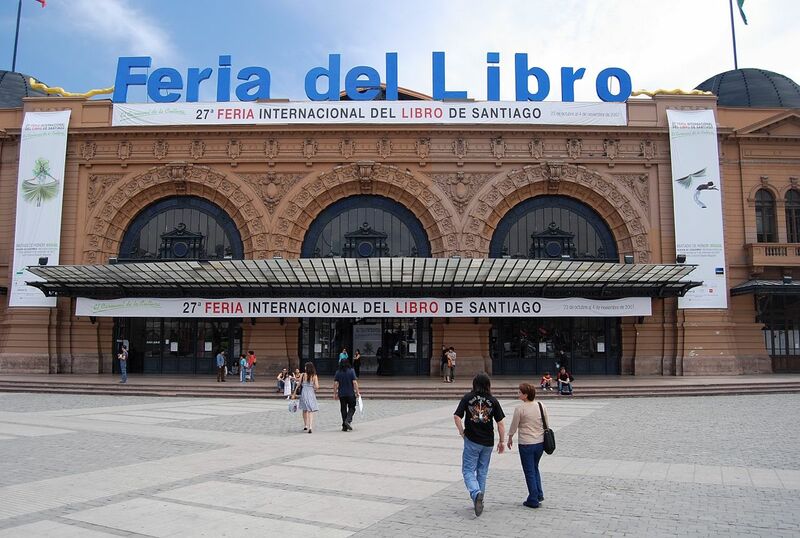 This obliged municipal authorities (headed by mayor Mauricio Macri) to raise fares substantially to try to reduce the operating deficit. A good part of that operating deficit involves wages to Subte workers, but that’s more complicated than usual because those workers, seeking wage hikes to keep their living standards from eroding under an estimated 25-percent inflation, are divided among themselves. One group, under teamster leader Hugo Moyano – who can make the late Jimmy Hoffa look like a romantic idealist– was able to come to terms with Macri but alienated a separate group of so-called “Metrodelegados” loyal to President Cristina Fernández de Kirchner, with whom Moyano and his supporters have fallen out. The public, meanwhile, grew indignant as they tried to get to their jobs everyday by surface transportation over streets clogged with buses. One of my nephews, who just had knee surgery and is on crutches, found that his usual 20-minute Subte commute from semi-suburban Belgrano to downtown Buenos Aires took him 2-1/2 hours by bus. For the moment, at least, the blame game has subsided and city commuters are returning, slowly, to the system – though apparently the Metrodelegados left many of the subways cars covered in graffiti and stickers. Given the political stakes, with Macri interested in running for president in 2015 and the president asserting her authority (a constitutional prohibition on re-election hasn’t stopped anybody from trying in the past), the issues involved are not likely to go away. As a relatively small buffer state between the giant Brazil and the large-enough Argentina, Uruguay has always had to make compromises with its imposing neighbors (when not being occupied or intimidated by them). It’s also been a country notable for its political and economic stability in a region that’s been notorious for their absence. 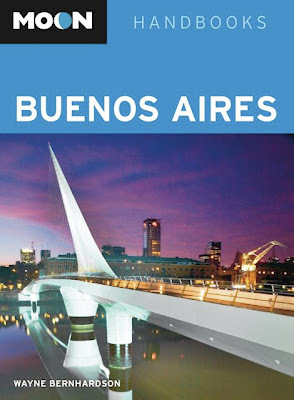 Many visitors to Argentina and Buenos Aires hop across the River Plate to visit Uruguay, whose coastal strip from Carmelo east to Montevideo and Punta del Este gets extensive excursion coverage in my Moon Handbook to the Argentine capital. 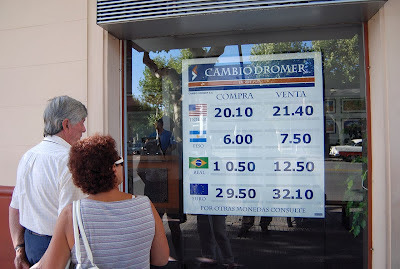 The official currency is the stable Uruguayan peso, but most local merchants readily accept US dollars, Brazilian reais, and Argentine pesos as well (the photo above is a couple years old, and the rates are no longer current). The latter, though, is becoming more problematical as the differential between Argentina’s official and black market exchange rates widens. According to the Buenos Aires daily Clarín, restaurants and other services in Punta del Este have said they will accept Argentine credit cards at the official exchange rate (about 4.60 Argentine pesos per US dollar), but will only accept Argentine cash at the black market rate (around 6.20 Argentine pesos per dollar). Even non-Argentines crossing the river to Uruguay this coming summer will find it disadvantageous to try to dispose of excess Argentine pesos there. Living in Argentina often means jumping through hoops – if, for instance, you need to purchase dollars to travel abroad – but for some Argentines it means playing or watching hoops. Over the past two weeks, I’ve paid little attention to the Olympics, which I find tedious – and not just because of horrendous TV coverage that seems to suggest that any sport without US participants is insignificant. Certainly there are inspiring stories but, far more often than not, the presentation is insufferably maudlin. While I’m neither an Olympics fan nor a basketball fan, I do find the story of the Argentine Olympic basketball team engrossing. In Argentina, this team is known as the Generación Dorada (Golden Generation) because, improbably, it defeated the United States’ so-called “Dream Team” in the semi-finals in the Athens games of 2004, and then won the Gold Medal over Italy. Other than the controversial Munich games of 1972, this was the only time the US ever failed to get the Gold, and the Argentines richly deserved it, thanks to the team-oriented efforts of Manu Ginóbili, Andrés Nocioni, and Luis Scola, all of whom have distinguished themselves in the National Basketball Association. This time, though, an aging Argentine squad lost twice to the US, most recently in yesterday’s semi-finals by a one-sided 109-83 score. While I’m no basketball authority, I expect it’s fair to say that the US team’s greater depth – in reality, it’s an NBA All-Star team – simply wore down the Argentines. Tomorrow, the Argentines will face Russia for the Bronze in what will almost certainly be Ginóbili’s Olympic finale – he will be 39 years old by the time the Rio de Janeiro games roll around in 2016, when Scola will be 36 and Nocioni (now playing professionally in Spain) will be 37. Basketball is, of course, a secondary sport in Argentina, where nothing will ever displace soccer. The Liga Nacional de Básquet (national professional basketball league) gets relatively little attention in the press, and probably tennis (where the country’s had many high profile stars, such as Guillermo Vilas) and even golf have a higher profile. Whether anybody in the near future will be able to approach the stature and accomplishments of the Golden Generation is open to question. 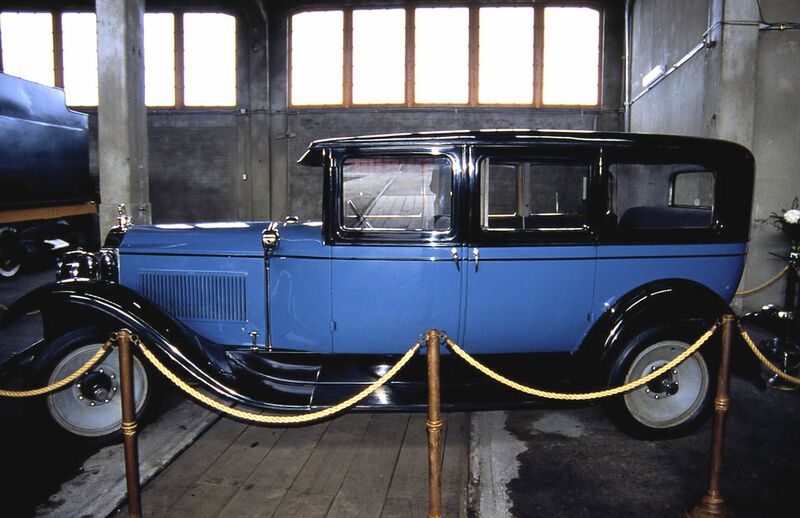 Except to a handful of know-nothings who deny that humans have any effect whatsoever on their natural environment, there is virtually unanimous agreement that carbon emissions from automobiles is a major contributor to air pollution and global warming. The Argentine city of Córdoba (pictured below), though, seems primed to tackle emissions as a public health crisis in a truly novel manner. For the longest time, one of the Southern Cone’s most disturbing features was the elevated level of tobacco consumption. That’s changed in recent decades, thanks partly to progressive tobacco-control laws that prohibit or limit smoking in restaurants and other inappropriate areas, though Chile’s statutes remain unfortunately weak. The latest in tobacco control, though, is a surprise, if not a shock – Córdoba appears ready to make driving while smoking a moving violation. In principle, anything that reduces tobacco consumption is good, but I have some doubts about this particular measure. It appears to completely ignore other comparable distractions, such as eating, drinking (liquids other than alcohol, which is already proscribed), talking or texting on a cell phone, or fiddling with the radio or MP3 player. All of these would appear to be equally risky behaviors for anyone behind the wheel of a vehicle that weighs several tons, but the ordinance apparently does not address them. The other issue is enforcement. While Argentine anti-tobacco legislation has been surprisingly effective, especially in Buenos Aires, to enforce a smoking while driving ordinance will require great professionalism on the part of a police force that, as often as not, simply doesn’t care much about issuing moving violations. Rather, they prefer to lurk along the roadside, arbitrarily stopping motorists for minor equipment violations (such as malfunctioning turn signals) that become opportunities for bribes. I’ve never had to deal with the Córdoba police in this regard, but it’s routine in the rest of the country. 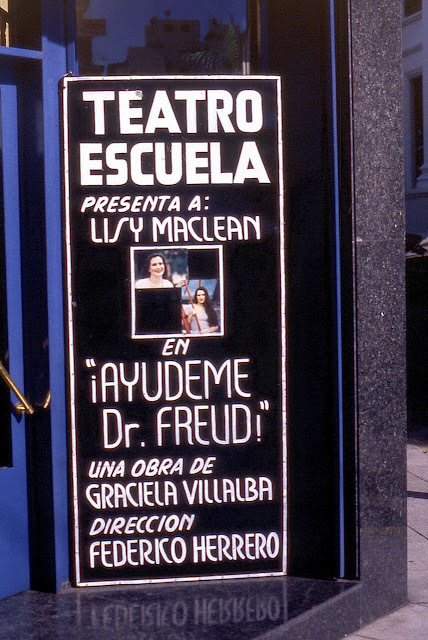 On Friday August 17, at 6 p.m., I will give a digital slide lecture on Buenos Aires at Tango by the River in Sacramento. Limited to a maximum of 50 people, the event will also include tango performances; admission costs $10, or $8 in advance. I have spoken here several times before, and we always sell out, so plan in advance. Signed copies of my Moon Handbooks on Argentina, Buenos Aires (pictured below), Chile and Patagonia will be available at discount prices.